TRENTON, New Jersey (WABC) -- A New Jersey State Police trooper died in an off-duty motor vehicle crash in Pennsylvania Sunday night. The accident happened on I-78 in Berks County. Trooper Brian McNally was a member of the 154th State Police Class, which graduated August 29, 2014. He was assigned to Washington Station. Prior to becoming a member of the New Jersey State Police, McNally graduated from the Citadel Military Academy and was a Captain in the United States Marine Corps Reserves. "The men and women of the State Police are devastated by the tragic loss of Trooper McNally," acting State Police Superintendent Colonel Patrick Callahan said. "Our heartfelt thoughts and prayers are with his family. Brian's life was a testament to his dedication to service of both state and country." The crash is being investigated by the Pennsylvania State Police. 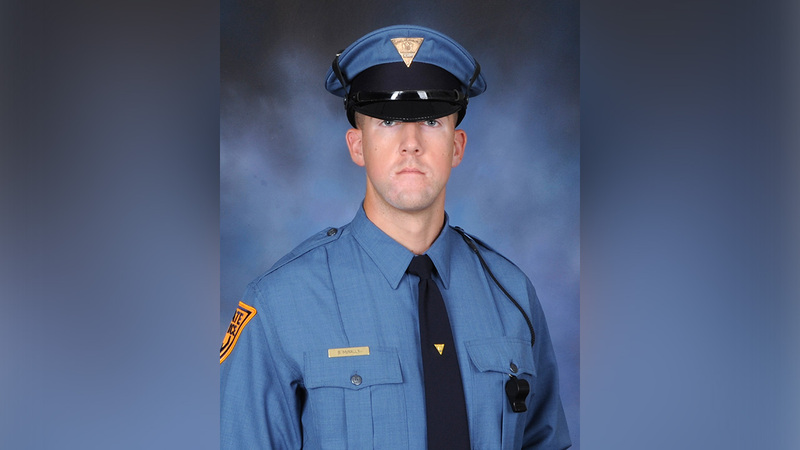 "Tammy and I are deeply saddened by the death of Trooper Brian McNally, who was killed in an off duty car crash yesterday evening while returning from weekend military service in Pennsylvania," Governor Phil Murphy said. "Our thoughts and prayers are with the McNally family and the New Jersey State Police at this difficult time."